Solids are crystalline or amorphous. Minerals, the building blocks of rock, are intricately structured crystalline solids. But glass is amorphous at an atomic scale. Vitrification, from the Latin vitreum meaning glass, is the transformation from an atomically structured material into non-crystalline amorphous glass. Discrete chunks of lava spewed airborne from a lava fountain, like the fountain in the active shield volcano Kīlauea, can rapidly cool and solidify into amorphous spheres and tear-shaped glass. 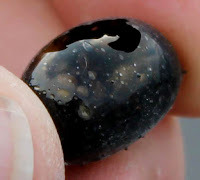 Vitrified lava found in the vicinity of Halemaʻumaʻu Crater (within the caldera of Kīlauea in Hawaiʻi Volcanoes National Park) is known as Pele's tears. Pele is a goddess in Hawaiian mythology. Pele's tears originate from molten lava cooled and fused into tear-like drops of glass. The Halemaʻumaʻu Crater is home to Pele the goddess of fire, lightning, wind and volcanoes. Pele is believed by some to be the creator of the Hawaiian Islands. "I am fated to journey hand in hand with my strange heroes and to survey the surging immensity of life, to survey it through the laughter that all can see and through the tears unseen and unknown by anyone." VHP Photo Glossary: Pele's Tears, USGS.